In what can be considered a what came first, the chicken or the egg, sort of symbiotic of relationship, we will never know if Earnest Hemingway could have written The Old Man and the Sea if he was clean and sober, and wasn’t wrestling with more demons than Anton LeVay. Fortunately, in the case of Warren Zevon, we have the exact answer. You can go home again, and second chances to make a great first impression are sometimes given, which is exactly what happened with the release of Bad Luck Streak in Dancing School in 1980. Following the somewhat out of the blue popularity of Excitable Boy, his sophomore record that owed much of its success to the howl at the moon epic, “Werewolves of London,” all ears were on Zevon, the anticipation was building, and much of the music listening universe wanted to know what to expect next from the enigmatic singer songwriter who had, in a few short years, established himself as one of the premier songwriters in Rock & Roll. Inhabiting a planet all his own, a world that included a werewolf, a couple of desperados, an accidental martyr, and a headless Thompson gunner, the elephant in the room was always the unanswered question that was on the lips, and in the hearts of most of his friends and family at the time. 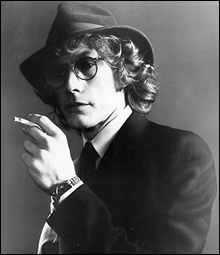 Would success spoil Warren Zevon? And it almost did, in fact, it almost killed him. 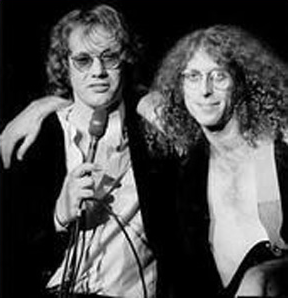 The victim of a couple of years in the making overnight success, an obsessive compulsive disorder, and a drinking problem that was starting to slide wildly out of control, Warren Zevon was on the mend, and relatively clean and sober when he entered the studio to record his third proper studio album. Despite the absence of what can be considered a real hit single, “A Certain Girl” peaked at number 57, and the Bruce Springsteen co-penned “Jeanne Needs a Shooter” did not even do that well, Bad Luck Streak in Dancing School is a much more focused effort than Excitable Boy, and is generally considered to be the better record of the two. If the well-worn axiom that you can tell a lot about a person by the company they keep is true, then judging by the stable of famous friends that appear on this album, Warren Zevon is a very fine fellow indeed. Daisy Duke era Linda Ronstadt, who covered several of his early works including “Carmelita” and “Hasten Down the Wind,” is in fine backing vocal form, his musical muse and benefactor, Jackson Browne, shows up all over the place, Original Eagles Don Henley, and Don Felder fly in for an appearance, and Joe Walsh adds some Classic Rock salt and pepper to the meal, most notably lending his guitar skills to the title track. And of course, no collaboration meal is complete without J.D. Souther, who seems to show up on just about every notable album coming out of the Laurel Canyon scene in the early 70’s, and makes an appearance here to provide that Cosmic Cowboy coolness to the proceedings. The opening string sequence, along with the two orchestral interludes built into the fabric of the album, serves to remind us that Zevon was one hell of a musician, and an excellent band leader, often times sitting in on the David Letterman Show filling in for the vacationing Paul Shaffer. The rockers in the set, including “Bad Luck Streak in Dancing School” with the signature Joe Walsh guitar riff, “Jeannie Needs a Shooter,” and “A Certain Girl,” with an almost Keith Richards like guitar interplay mid-song, are all straight-up, great rock songs. The introspective potion of our program rears its Dr. Phil head with “Bed of Coals,” where Warren jumps back on the piano stool and seems to admit to his shortcomings on a song that stands right up there with “Hasten Down the Wind” as one of his very best pound for pound songs, and drives the stake right into the heart of the vampire with “Wild Age,” a song that puts everything we now know about Warren Zevon, his life, and his ultimate passing, into perfect perspective. “Play it All Night Long,” and “Gorilla, You’re a Desperado” are both songs that while they don’t seem to quite fit thematically, they are both classic Zevon fare where the images that are brought forth in the theatre of the mind can be downright disturbing in a Quentin Tarantino sort of way. 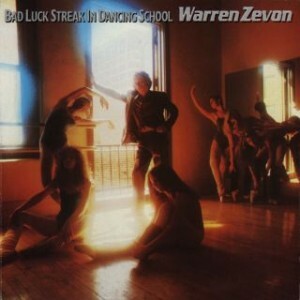 For my money, Bad Luck Streak in Dancing School is Zevon’s best work. The production value is first rate, the vocals, never a strong suit, are well north of adequate, he mood sets the tracks perfectly, and the songwriting is best in class. Following these albums there would be a dry spell with albums like The Envoy, Sentimental Hygiene, and the horrible Transverse City, marking a period of mediocrity that continued until the prophetic, Life’ll Kill Ya, and the mailed it in My Ride’s Here started to signal the winding down of his career. The story has a happy ending with Warren leaving on his own terms, releasing his personal eulogy,The Wind, only months before dying of cancer in 2003. At his best, Warren Zevon is the Singer-Songwriter version of novelist Elmore Leonard, with heroes and anti-heroes serving in a world that would make Charles Bukowski move to the suburbs. At his worst, this werewolf of London is a love-struck, wisenheimer cynic that has an unquenchable need to make sure everyone knows he is the smartest guy in the room, and he probably is. All songs written by Warren Zevon, unless otherwise indicated.